Houses & Homes VA: Fix Your Slow Filling Washer in Record Time! Fix Your Slow Filling Washer in Record Time! 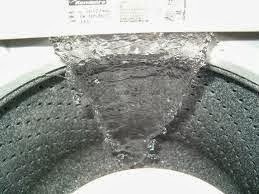 A slow filling clothes washer is a very common problem and usually fixing it requires very little time and effort. Washing clothes isn’t usually an exciting chore to begin with and waiting for the tub to fill up can be a frustrating experience. The 2 most common causes are either built up residue (scale) on the fill valve screen or a faulty valve. Here’s the easiest way to figure out what the problem is and how to fix it. Turn on the fill cycle and listen carefully. If you can hear a “buzz” or “hum” coming from the machine but the water is filling too slowly than rest assured you have discovered the problem. Your first step is to close the water valves on the rear of the washer and disconnect them from the machine. Sometimes there are filters built into the end of the hoses. If your machine has these filters this would be a great time to remove and clean them. You can use a small knife to simply scrape the filters and then replace them. While you’re there you might as well flush the hoses at the nearest sink just to be sure there’s no debris blocking the flow of water. Replace the washers at each end of the hoses before replacing them as well to ensure against future leakage. An ounce of prevention is worth a pound of cure. Test the washer by opening the water valves again and filling the washer. If it fills quickly than your problem is solved. If not then it’s time to replace the valve. This is quite simple to do if you’re the least bit “handy” and a screw driver and pliers is all you will need. If you don’t hear anything when attempting to fill the machine and no water is making its way into the tub than you might have a more serious problem. The first thing you should do in this case is to remove the fill valve and have it tested. If the valve is working properly than your problem is something more serious such as an electrical problem or a bad timer. This is when you will need to call a professional but 99% of the time the above mentioned fixes are all that will be required. At the very least you will know that service is required and won’t be wasting your money to fix something that you could easily have done yourself. Some of the better washing machines may be either a belt drive or direct drive machine and sometimes getting to the inner components may take a little extra work as compared to a more standard design. The procedure to test these machines is the same as above but you might need to remove an additional cover plate or part of the metal shell of the machine to get to them. If you’re not sure take a moment to refer to your owner’s manual to become familiar with the design.